Kyiv is a special institution for orphans with minor learning disabilities such as dyslexia or dysgraphia (writing disorder). There are 49 children aged 8 through 16 currently at the orphanage. The children live in 5 groups and attend a special school located within the orphanage compound. Each group operates as a 'family unit' and consists of 9-11 children of different ages. Two or three caretakers work with each group. Unlike regular orphanages, Kyiv does not provide secondary education to the children. After leaving the orphanage at the age of 16 the children are not academically eligible for most trade schools, let alone colleges or universities. The children are considered mentally retarded and 'unfit' for further education. Out of more than 30 vocational schools in Kyiv only three of these will accept graduates of Kyiv. 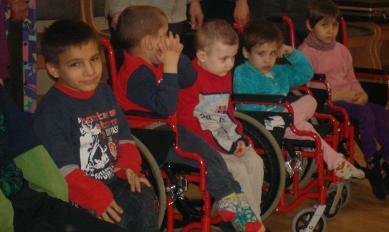 Tsurupinsk Children's Home is home to 123 physically and learning disabled children ages 4 to 18. Many of the children have major physical handicaps that make it difficult for them to move around and support themselves (i.e missing limbs). Tsurupinsk is located in southern Ukraine in the Kherson region approximately 350 miles south of Kyiv. The children are located in two orphanage buildings, one for the physically disabled (76 children) and one for the learning disabled (47 children). The City recently opened a third institution which operates as a separate school for the learning disabled children. These children now leave the orphanage each school day and attend school. Teachers still visit the physically disabled children at the orphanage for school. Sadly, many of these children never leave their bed. Mykolaivka Internat is a boarding school that houses approximately 170 children from the ages of 7 years old to 17 years old. 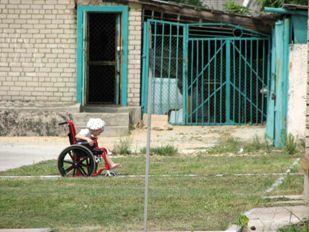 All the children who live at Mykolaivka Internat are labeled as learning disabled. They also all have some type of handicap such as cross eyes, cleft palate, epilepsy, speech delay, or attention disorder. Mykolaivka Internat is in a very rural area located about 45 miles north of Kramatorsk. There are no restaurants, movie theaters, bowling alleys or any other recreational facilities nearby. Basically the children have their school building, cafeteria and dormitory. There is a small open market within walking distance. If the children are fortunate to have any spending money, they can go here to buy what they need or want. Mykolaivka Internat (“Myko”) is considered a special needs orphanage. Many children who reside at Mykolaivka, typically score lower than average on placement tests, and therefore struggle academically. An Orphan Smiles offers a sponsorship program for the children at Mykolaivka called “K.I.D.S. (Kindness is Donating Smiles)”. 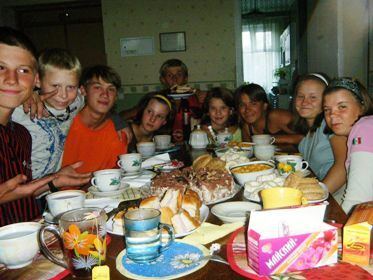 Our sponsorship program matches a caring adult or family with one of the orphans at Mykolaivka. The hope is the child will develop a friendship and relationship with someone who will care about them and encourage them to grow emotionally and educationally. To learn more about the K.I.D.S. sponsorship program, click here. If you would like to propose an orphanage to be considered for assistance, please contact us at info@AnOrphanSmiles.org.